The world’s deep ocean covers over half the planet and contains a vast amount of untapped energy resources, precious metals, and minerals. ELI is working to ensure that this largely unexplored portion of the undersea environment is managed in a comprehensive and sustainable way as demand for these resources is on the rise. 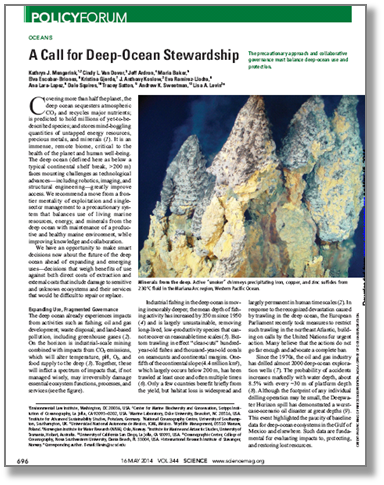 To this end, members of ELI’s Ocean Program team have coauthored a policy forum in Science magazine, calling for stewardship of the deep sea environment that sustainably balances exploitation of natural resources with maintaining this ecosystem’s complex ecology. Read our blog post on the subject here, where ELI Ocean Program Director Kathryn Mengerink argues that now is the time to take action to ensure that these new uses are developed in a way to protect and maintain the long-term health of the common heritage of mankind and the water column above it. She concludes that must take steps to understand the great unknowns and prevent permanent harm to the deep ocean. On April 22, 2015, building from the findings of the paper, we hosted a webinar that brought together some of the foremost experts on deep seabed mining to discuss this pressing issue. Of particular relevance are the ISA’s Exploitation Regulations, released in draft form on March 13 and open for public comment until May 15. In light of these important legal developments and leaps forward in scientific understanding, now is the time to pause to consider the special nature of the deep ocean and how to best manage it.